Okay, maybe that headline is a bit unfair, but I couldn't resist. Making at least 718 horsepower the new Porsche Spyder should deliver zero to 60 mph speeds of at least 3.1 seconds (we're betting sub 3.0) and a top speed just shy of 200 mph. The fact is, with an MSRP of $845,000 the Porsche 918 Spyder is still a bargain (relatively speaking of course) considering you get all this performance coupled with its exclusivity, design aesthetics and the ability to deliver up to 78 mpg if you drive it "economically". For those with who can back the desire with cash, the new Porsche Spyder can be ordered as of today. Production is limited to 918 world wide and I'm betting we're only a short bit away from another press release letting us know they have completely sold out. Once ordered, production will commence on September 18, 2013 and will begin in the same sequence they were ordered. For those that can't wait to tell the world of their new Porsche purchase they can order a special edition 911 Turbo S for delivery later this year. This special Turbo S is only for those who order a 918 as well. Besides having interior and exterior design elements that "echo" the plug-in 918's styling, it will also feature the same production number as the customer's 918 Spyder. Given this, we predict a few of these special editions Turbos will eventually make their way into the secondary market at some point in the future. If they do, expect prices to skyrocket (in the distant future) as those with deep enough pockets to pick up the original 918 Spyder will surely want to reunite it with it's long lost Turbo S cousin at some point. For more details on both cars the official Porsche press release is below after the photo gallery. 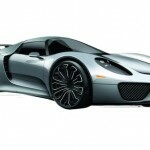 After outstanding customer response to the concept car first shown at the 2010 Geneva Motor Show, Porsche today announced that dealers around the world will begin taking 918 Spyder customer orders. This is a significant step toward actual production of the company’s next super sports car, a Porsche that marries unique plug-in hybrid technology and outstanding performance in a visually stunning and purely Porsche package. The 918 Spyder will feature a high revving 500-plus horsepower V8 engine assisted by two electric motors with a total of at least 218 horsepower, yet Porsche estimates it will consume only 3.0 L/100 km based on the New European Driving Cycle (NEDC). Official EPA fuel economy figures or estimates will be announced just before the first customer cars begin arriving in the United States near the end of 2013. To ensure the 918 Spyder’s worldwide exclusivity, Porsche will produce no more than 918 examples. Start of production at Porsche’s famed factory in Stuttgart-Zuffenhausen is planned for Sept. 18, 2013 (9/18), and the U.S. base manufacturer’s suggested retail price is $845,000 (excluding destination and handling charges). With its design inspired by past Porsches like the Carrera GT super sports car and the legendary 917 and highly successful RS Spyder race cars, the 918 Spyder remains faithful to the 2010 concept car. Unlike the concept car, the two-seat production version, based on a carbon fiber-reinforced plastic monocoque, will feature a manual roof system with removable panels that can be stored in the front luggage compartment. The 918 Spyder will be powered by a unique plug-in hybrid system that will include a high-revving, mid-mounted V8 engine with capacity of more than 4.0 liters and producing at least 500 horsepower. The engine will be based on the Porsche RS Spyder racing engine that demonstrated its impressive performance and efficiency through multiple Michelin Green X Challenge victories in the American Le Mans Series, the Le Mans Series and the 24 Hours of Le Mans. Power will be transferred to the rear wheels via Porsche’s compact, seven-speed Porsche-Doppelkupplung (PDK) double-clutch gearbox. Two electric motors – one each on the front and rear axles – together will provide approximately 218 additional horsepower. This configuration also will offer an innovative, variable all-wheel drive system with independent control of the drive forces on both axles. Electrical energy will be stored in a liquid-cooled lithium-ion battery that can be recharged from a standard household outlet. Electric-only driving range is expected to be more than 16 miles on the NEDC. Recharge time will depend on each country’s electrical power network, but charging is expected to take about seven hours at 110V/10A in the United States. A quick-charge option is being evaluated to further reduce charging times. With anticipated combined fuel consumption of just 3.0 L/100 km on the NEDC, this equates to CO2 emissions of only 70 g/km or 112 g/mile. On the other hand, the Porsche 918 Spyder will deliver super sports car performance. It is estimated that the final production version will accelerate from zero to 60 mph in about 3.1 seconds on its way to an estimated top track speed of 199 mph. It should also tackle Germany’s famed Nürburgring Nordschleife in less than 7 minutes and 30 seconds, two seconds faster than the Porsche Carrera GT. Under the right conditions, the 918 Spyder will be able to drive on electric power alone at speeds up to 94 mph for limited distances. Customers who order the 918 Spyder also have the opportunity to acquire a special-edition 911 Turbo S Coupe or Cabriolet. Also limited to no more than 918 units, the 911 Turbo S Edition 918 Spyder will have exterior and interior design elements echoing the plug-in hybrid 918 Spyder supercar’s styling. It features similar exterior colors, carbon-fiber elements inside and out, enhanced leather equipment and numerous acid-green accents on items such as the brake calipers, illuminated sill plates, interior stitching and instrument cluster needles. A limited-edition badge on the glove compartment door will feature the same production number as the customer’s 918 Spyder. Worldwide 918 Spyder customers can begin ordering this special edition 911 Turbo S sports car today, and customer deliveries will start later in 2011. The U.S. base manufacturer’s suggested retail prices for the Coupe and Cabriolet versions are the same as the standard 911 Turbo S models, $160,700 and $172,100 respectively, excluding destination. Damn, that’s over $1 mill for both… But then again, I still think its a bargain! Great car, can’t wait to see one in the flesh some day. But come on, a “bargain”? Really? what’s up with the turbo S becoming a 918 spyder edition ? @Bill, I did say “relative”. Regardless, Nitro summed it up pretty well. Compared the its competitors (of which it currently has none) and then other “supercars” it really is a “bargain”. I always look forward to your comments as they are generally well written and insightful. However, I don’t always agree with the points in them and this is one of those cases. 1. I think the 911 is far, far away from having lost its “aura”. In fact, I can think over over 1,000,000 fans on Facebook who would agree with me (just to name a few). 2. 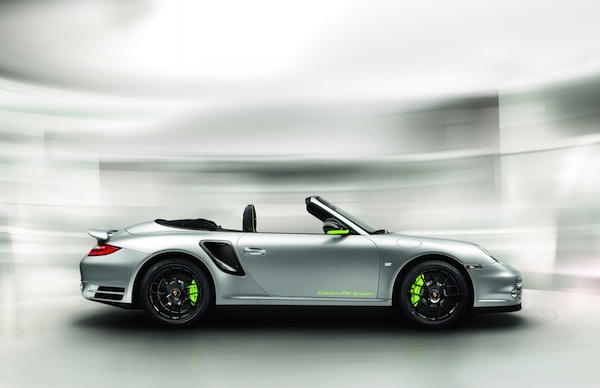 How does a Spyder edition take away from the Turbo S? It is, after all, only an “appearance package”. 3. As for “bad marketing”, I think you’re missing the point. What better way for future 918 owners to show to the world they have a very special Porsche on the way than to purchase the current king of the Porsche ring in an edition only available to 918 buyers? Further, as it’s no secret that this iteration of the 911 is on the way out the door, why shouldn’t Porsche create these special package that create a little extra demand? No brand muddling here, just solid business and marketing sense. I’m not old enough to have been a “mature” admirer or owner in the 80’s or 90’s, however, I was an “admirer” since I was 4 years old (which was 2 decades ago), and although I kinda agree that Porsche lost “some” aura due to the marketing team, but their marketing strategy allowed Porsche to continue. If Wiekling hadnt brought these mass production methods in 1993 (I think), Maybe there wouldnt be Porsche’s to admire today, nor will they have been as reliable as they are! Or even just admired her lines from the 3/4 rear angle. But again, I agree to the point that I dont like the fact that Porsche makes “special editions” mostly by looks and not performance! I don’t believe we’ve met, so it would be hard for you to know my age and what I’ve experienced. While I only really became a Porsche fan in the last 15 years (when I first met my husband) I’ve known the brand for some time. My interest, coupled with publishing this site and having a fair number of Porsches (both new and old) in the garage gives me a fairly decent understanding of Porsche and their history. It sounds like you blame the demise of the 911 on the 996. While definitely not Porsche’s best, there are still some reasonably good examples to be found in this model range and thousands and thousands of current 996 owners who love their Porsche. Granted, I would personally never own a 996 (well maybe the ’03-’04 Turbo), as I don’t like the “egg drop” design of the front lights, but there are still some good examples to be had. Wait, the 918 can get 70+ mpg? And I thought the Prius was green.